HOTROD 60 n Performance & Hotrod Business n February 2015 It takes care of most every welding need in my shop, from welding on res- toration replacement panels to creating custom parts. I only wish the kid I talked about in the opening paragraph had not been so close-minded when it came to newer equipment. I also reached out to two leg- endary fabricators and asked them about what they use in their shops and how they feel about this subject. 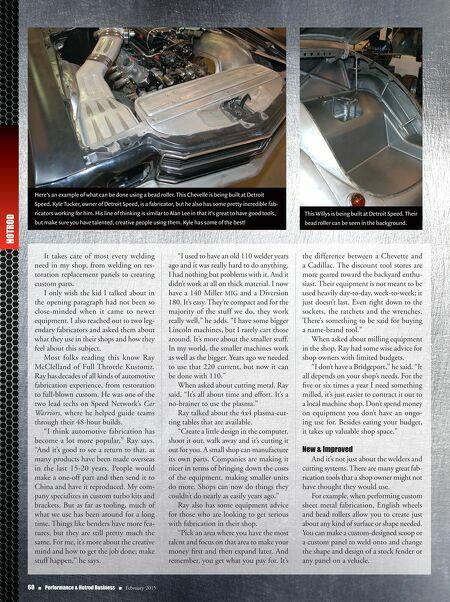 Most folks reading this know Ray McClelland of Full Throttle Kustomz. Ray has decades of all kinds of automotive fabrication experience, from restoration to full-blown custom. He was one of the two lead techs on Speed Network's Car Warriors, where he helped guide teams through their 48-hour builds. "I think automotive fabrication has become a lot more popular," Ray says. "And it's good to see a return to that, as many products have been made overseas in the last 15-20 years. People would make a one-off part and then send it to China and have it reproduced. My com- pany specializes in custom turbo kits and brackets. But as far as tooling, much of what we use has been around for a long time. Things like benders have more fea- tures, but they are still pretty much the same. For me, it's more about the creative mind and how to get the job done; make stuff happen," he says. "I used to have an old 110 welder years ago and it was really hard to do anything. I had nothing but problems with it. And it didn't work at all on thick material. I now have a 140 Miller MIG and a Diversion 180. It's easy. They're compact and for the majority of the stuff we do, they work really well," he adds. "I have some bigger Lincoln machines, but I rarely cart those around. It's more about the smaller stuff. In my world, the smaller machines work as well as the bigger. Years ago we needed to use that 220 current, but now it can be done with 110." When asked about cutting metal, Ray said, "It's all about time and effort. It's a no-brainer to use the plasma." Ray talked about the 4x4 plasma-cut- ting tables that are available. "Create a little design in the computer, shoot it out, walk away and it's cutting it out for you. A small shop can manufacture its own parts. Companies are making it nicer in terms of bringing down the costs of the equipment, making smaller units do more. Shops can now do things they couldn't do nearly as easily years ago." 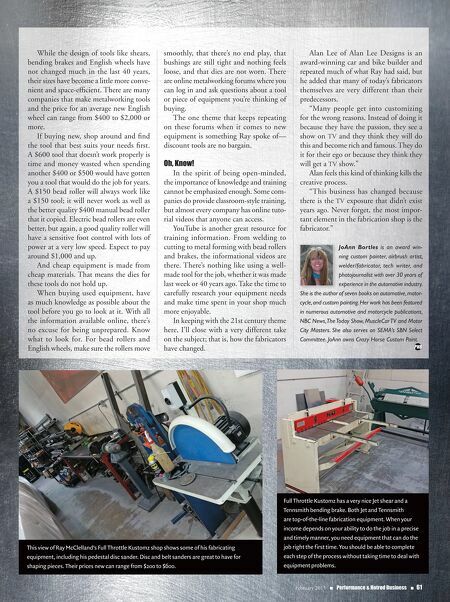 Ray also has some equipment advice for those who are looking to get serious with fabrication in their shop. "Pick an area where you have the most talent and focus on that area to make your money first and then expand later. And remember, you get what you pay for. It's the difference between a Chevette and a Cadillac. The discount tool stores are more geared toward the backyard enthu- siast. Their equipment is not meant to be used heavily day-to-day, week-to-week; it just doesn't last. Even right down to the sockets, the ratchets and the wrenches. There's something to be said for buying a name-brand tool." When asked about milling equipment in the shop, Ray had some wise advice for shop owners with limited budgets. "I don't have a Bridgeport," he said. "It all depends on your shop's needs. For the five or six times a year I need something milled, it's just easier to contract it out to a local machine shop. Don't spend money on equipment you don't have an ongo- ing use for. Besides eating your budget, it takes up valuable shop space." New & Improved And it's not just about the welders and cutting systems. There are many great fab- rication tools that a shop owner might not have thought they would use. For example, when performing custom sheet metal fabrication, English wheels and bead rollers allow you to create just about any kind of surface or shape needed. You can make a custom-designed scoop or a custom panel to weld onto and change the shape and design of a stock fender or any panel on a vehicle. Here's an example of what can be done using a bead roller. This Chevelle is being built at Detroit Speed. Kyle Tucker, owner of Detroit Speed, is a fabricator, but he also has some pretty incredible fab- ricators working for him. His line of thinking is similar to Alan Lee in that it's great to have good tools, but make sure you have talented, creative people using them. Kyle has some of the best! This Willys is being built at Detroit Speed. Their bead roller can be seen in the background.